It's unthinkable to imagine not being able to offer Camp Lighthouse and other youth programs for kids with vision loss! With warmer weather finally upon us, we're busy gearing up for summer and our annual programming for children who are blind or visually impaired. Being in a camp that is only for children who are blind or low vision helps my daughter feel okay about her vision. It lets her connect with other children who encounter similar issues in their lives and who can understand her issues in a way that a sighted person cannot. She has made a lot of friends and really feels like she fits in at camp. It costs Columbia Lighthouse for the Blind approximately $1,000 per child for a week's worth of camp activities at the Silver Spring YMCA. 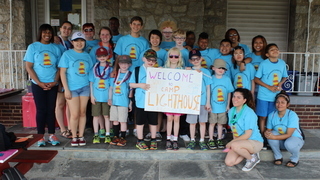 Please consider making a tax-deductible donation to support Camp Lighthouse and additional youth programming today. We thank you for your support!